60 Seconds to Slim is a weight loss program created by nutritionist Michelle Schoffro Cook, PhD. Cook shows readers that losing excess fat rapidly and permanently is simply a matter of balancing body chemistry. The 4-week program is based on a natural approach to healthy weight loss. 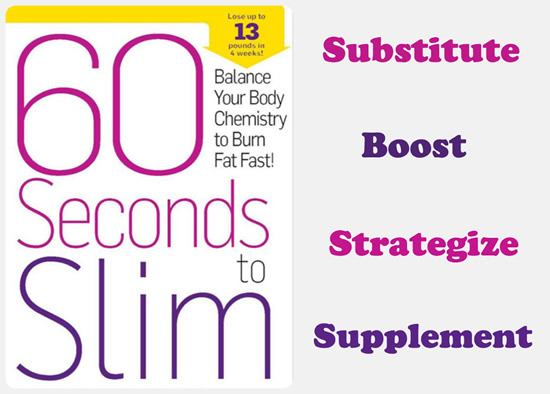 60 Seconds to Slim includes a collection of weight loss tips and tricks that take less than a minute to implement. This means that you don’t waste time on complicated methods that don’t work. Successful weight loss requires making just a few simple 60-second changes to your regular routine. Even though these methods take less than a minute to implement they have profound effects on your health and weight. This way you don’t need to devote your entire life to achieving your weight loss goals. The plan is based on balancing body chemistry to make the body more alkaline. Reducing your intake of acidic food in favor of alkaline choices creates balance at the cellular level. In turn this allows your body to start breaking down fat stores and ultimately promotes weight loss. Each week you will also incorporate at least five 60-second tips, which target a specific aspect of weight loss. Every tip brings you one step closer to balancing your pH and boosting your metabolism. Dieters will learn how to eat an alkalizing diet to flush the fat and revitalize the body. The first step is to eliminate harmful foods and ingredients that may be causing weight gain. Things to avoid include sugar, artificial sweeteners, MSG, white flour, trans-fats, and high-fructose corn syrup. In the second week the focus is on adding more metabolism-boosting superfoods to the diet. Each food offers unique benefits for reducing inflammation, supporting detoxification or fat-burning. Dieters will continue to consume these foods for the duration of the program. This week teaches about scientifically proven timing tricks and fat-burning strategies to maximize weight loss. Dieters will discover how to supercharge your body’s pH balancing abilities, balance hormones, improve digestion and enhance detoxification pathways. This week concentrates on proven weight-loss nutrients and remedies to help dieters choose the ones that will work for them. A person doesn’t have to take all the remedies outlined in this section, but just select two that relate to any specific health issues or weight loss challenges they are experiencing. Supplement with quercetin to dissolve stubborn fat. Inhale vanilla to stop cravings. Improve liver function and fat metabolism with natural herbs like milk thistle, dandelion and turmeric. Quinoa, black beans, almonds, sunflower seeds, beets, broccoli, bok choy, kale, sprouts, cucumber, avocado, purple grapes, cherries, grapefruit, cranberry juice, shrimp, chicken breast, wild salmon, apple cider vinegar, coconut oil, seaweed, chilies, onions, garlic, green tea. Exercise is an essential component of the 60 Seconds to Slim Plan and also influences body pH Dieters will exercise for at least 30 minutes every day. Readers are encouraged to include interval training because it increases fat loss by up to 400 percent. You should also perform resistance training exercises like weight lifting at least twice a week. This type of activity results in a 73 percent increase in fat burning for hours afterward. 60 Seconds to Slim: Balance Your Body Chemistry to Burn Fat Fast! retails at $26.99. 60 Seconds to Slim does not require a large time commitment to be successful. Integrates gradual changes in lifestyle to support long-term health. No calorie counting or measuring portions. Includes a 7-day meal plan and 50 recipes. Recognizes the emotional aspects of weight gain. Weight loss may occur slowly for some individuals. 60 Seconds to Slim requires elimination of a variety of foods including meat, sugar, coffee and alcohol. May involve more time for food preparation. The diet includes foods that may be unfamiliar to some dieters. 60 Seconds to Weight Loss focuses on alkalizing the body to enhance fat burning and boost metabolism. You can achieve your goals by making simple changes that don’t require a lot of time. This gradual step-by-step approach makes it easier to adopt a healthy lifestyle for long-term weight management.